Heat oven to 220C/ 425F/ 200C fan/ 390F fan / gas 7. Slice the aubergines in half lengthways, leaving the stem intact. 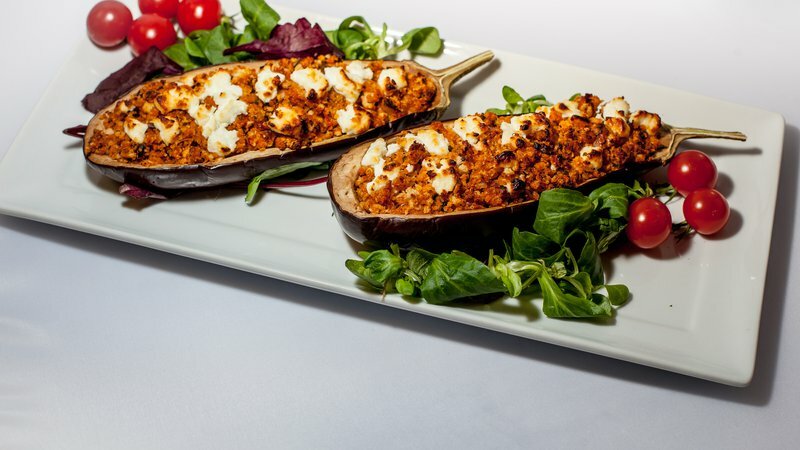 Using a small knife, cut a border inside each aubergine about ½-1cm (.4 inch) thick. Using a teaspoon, scoop out the aubergine flesh, so that you have 4 shells. Brush these with a little of the oil, season and place in a baking dish. Meanwhile, add the remaining oil to a non-stick frying pan. Tip in the onion and cook until soft. Tip in the garlic and tomatoes and cook for 3 mins more. Stir in olives, basil, mozzarella and seasoning. Allow to cool for 5-6 mins, once cooled, add mix to a bowl with breadcrumbs and toss together. Once ingredients are blended together, pile stuffing into shells and sprinkle with some mozzarella.